The Village Green Project initialized target was to supply long-lasting and real-time measurements for communities awareness of outdoor air pollution. In our study, this system is the first time used in a tropic area, which means may affect by long-time rainfall or high temperature than other temperate zones. The whole system provided ozone and fine particles measurements, meanwhile supply meteorological measurements. 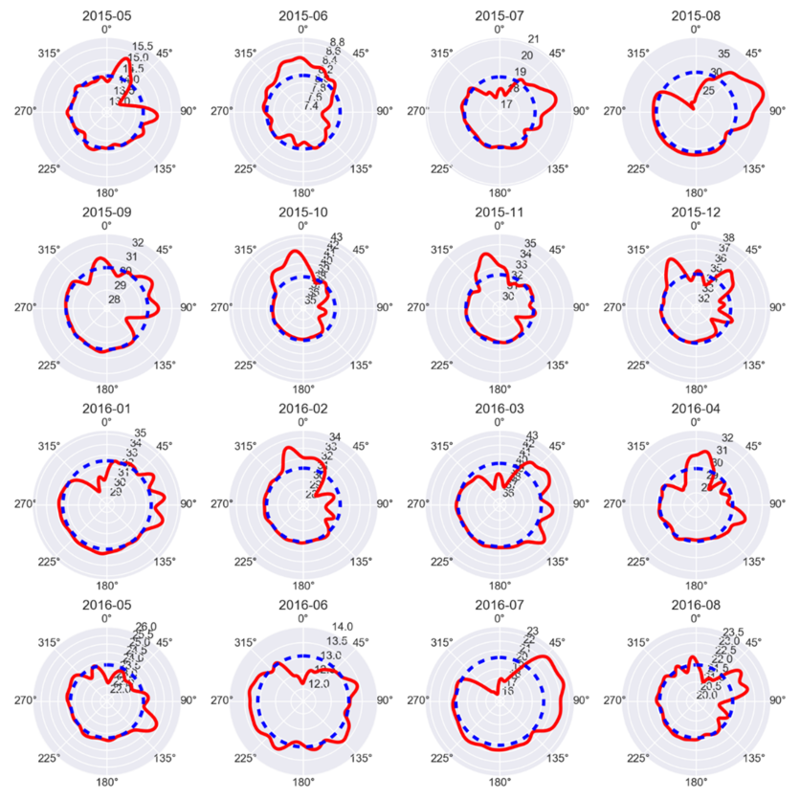 The whole measurements last from 2015/05 to 2016/08, 15 months time series data compared with nearby EPD station measurements, the time resolution is 1d. Both PM2.5 and O3 demonstrates similar trend with EPD measurements, the R2 are higher than0.79. Fig 4 shows the two sites measurements strong relationship which R2 are both higher than 0.79, meanwhile, the distribution of two sites are very close. But PM2.5 of VGP site are higher than EPD site(25 vs 19 ug/m3 ), which means VGP site may have some other local sources, while O3 show the opposite trend(31 vs 47 ppb). The VGP work principle based on solar panel, so the data validity has direct relationship with local solar illumination, a diurnal battery voltage implied system work status, the normal working voltage ranged from 11.5 to 13.7V, the lost data was caused by low power which was the result of lower illumination time. In general, the whole system can maintain normal work status from 8:00 to sunset and lasted until the mid-night. Based on the wind direction measurement and pollution measurements, combined with a non-parameter method, the source direction can be estimated. 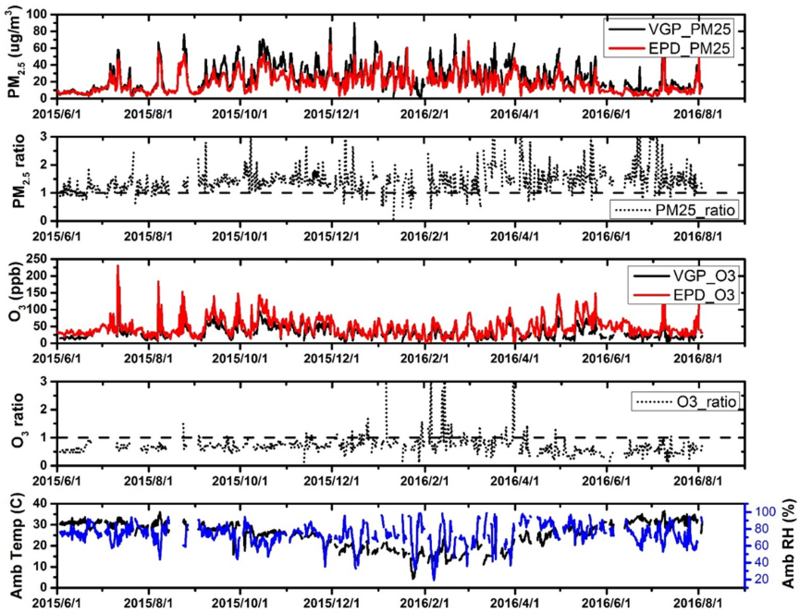 Fig 6 is a PM2.5 pollution source polar map which based on nonparametric regression method, the PM pollution source direction seems varied a lot each month, however, the monthly average concentration are different meanwhile. 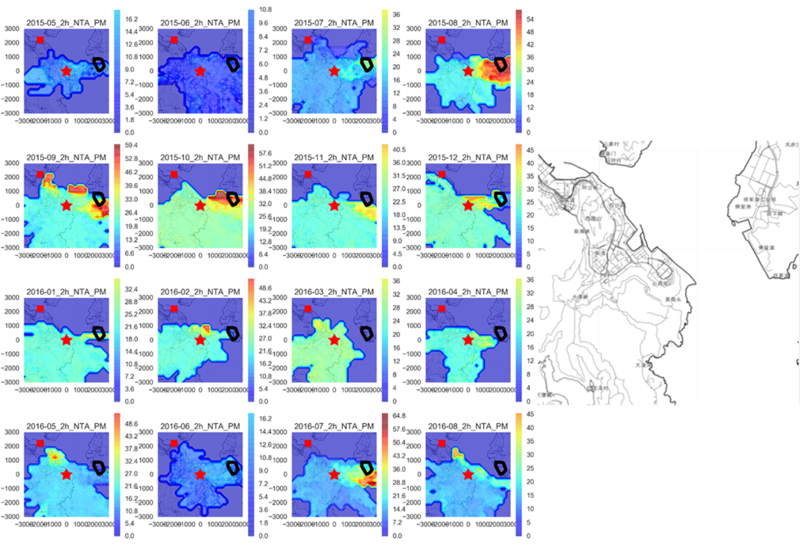 So, the months which have a larger average concentrations and variation of maximum-minimum have significant instruction, for example, 2015-08, 2015-10, and 2016-07, these 3 months demonstrated a pollution source at east direction and northwest direction. NTA method is based on NPR model and make improvements which also combined high resolution back-trajectory and pollution measurements. In the Fig7, the map size is 6km*6km scope, the red star at the central is VGP receptor, on the east is landfill which marked in black frame, the red square on the west north is a nearby harbor. As illustrated, the NTA PM2.5 pollution range mainly affected by back-trajectory range, when the back-trajectory reach the map edge, nearly the same source location were identified, which demonstrated the pollution source located at landfill area, meanwhile the monthly averaged concentration are higher at these months.